Recent studies suggest that 65 per cent of children entering primary school today will have jobs that do not yet exist. While more girls are attending school than before, girls are significantly under-represented in STEM (Science Technology Engineering and Mathematics) subjects in many settings and they appear to lose interest in STEM subjects as they reach adolescence. 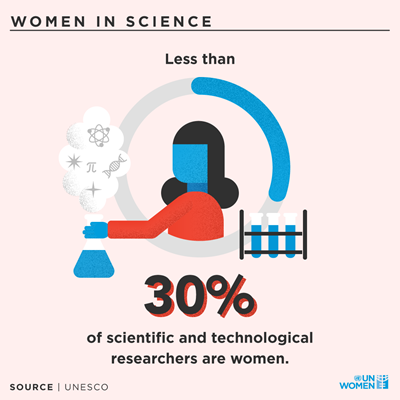 Debunking the myths that girls do not like the sciences and other and gender stereotypes, along with investment in teacher trainings, gender-responsive technology and innovation can reverse these trends. As the fourth industrial revolution starts, women still have less than two-third of the economic opportunity that men have. The jobs of the future will be driven by technology and innovation, and if the gender divide in STEM is not bridged soon, the overall gender gap is likely to widen.